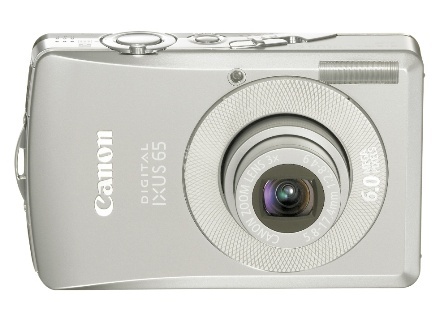 Canon Digital IXUS 65 or Canon PowerShot SD630 Digital ELPH is a small profile and ultra-compact digital camera features 6.0 megapixel resolution, 3x optical zoom 35 – 105mm (35mm equivalent) with UA lens, DIGIC II, iSAPS and 9-point AiAF, 16 shooting modes, My Colors in-camera photo effects, 30fps VGA movie clips with sound, high ISO Auto and ISO 800 for flash-free indoor shooting, widescreen (16:9) still image recording and 3-inch 173,000-pixel LCD display. ComputerAct!ve (dead link) reviews Canon Digital IXUS 65 digital camera, gives the IXUS 65 overall rating of 4 out of 5 and concludes that Canon IXUS 65 takes great pictures and sports a snazzy design but the 3x optical zoom could be improved. The good points are solid metal build, stylish looks and innovative features plus pin sharp images, while bad points are at the higher end of the price spectrum and zoom capability is nothing special. 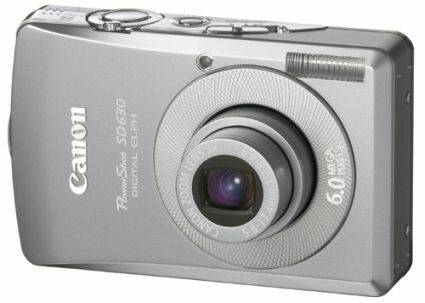 Digital Camera Tracker (dead link) reviews Canon PowerShot SD630 Digital ELPH and concludes with rating of 7.5 out of 10 that “taking pictures with the Canon SD630 was enjoyable and easy. In the picture quality area there is nothing to complain about because the SDF630 delivers snappy photos with vivid color that seem to jump right off the monitor. It’s fast to turn on, power up and recycle time between shots seemed almost instantaneous. Steve’s DigiCams concludes that Canon PowerShot SD630 is a outstanding camera that offers great image quality, robust performance, and various user-friendly exposure modes, all packed in an ultra-compact, durable and stylish shell. It’s sure to make an excellent choice for any user in the market for an extremely pocketable, high resolution digicam. At about US$399, it offers a good value for an “ultra-compact” 6-megapixel model. If you like the features of this camera, but don’t need such a large LCD, be sure to check out the PowerShot SD600. It includes almost every single feature found on this model for about $50 less.